Sometimes a banner week means big news. Sometimes a banner week literally means a week in which you make a banner. Sometimes it’s a big banner. And sometimes you have a blog on Education Week where you share these developments. 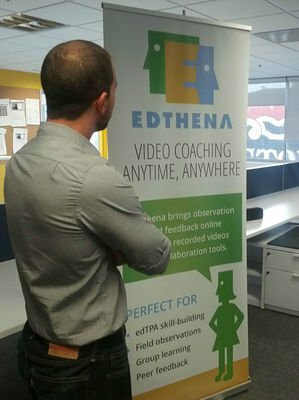 We printed this 80-inch-tall banner emablazened with the Edthena logo and our best summarizing bullets, so we could have more marketing materials when we go to conferences. This week we’ll be at the National edTPA Implementation Conference. Here’s to celebrating our foray into oversized, pop-up-marketing materials with you, dear blog reader.